Honda has received industry recognition for its commitment to developing the latest vehicle innovations at this year’s inaugural Great British Fleet event. 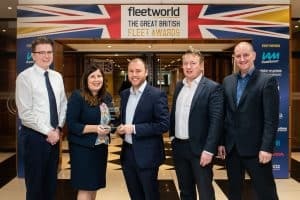 The manufacturer was named winner of the 2019 Fleet Technology Award at a gala awards ceremony held at London’s Hotel Novotel on January 24th. Honda was recognised as continuing a long tradition of focusing on high-end technology to boost the appeal of its vehicles, both among the driving public and business users. Fleet engagement manager at Honda Jacqueline Rowe commented: “We are passionate that for a Honda to be a Honda, it must be different to every other fleet vehicle on the road and this award demonstrates that this is very much the case. The manufacturer’s Honda SENSING and Honda CONNECT systems were highlighted in particular as offering advanced safety and connectivity packages to help separate Honda from its rivals. Fleet-specific services, including Honda’s new interactive whole lifecycle costs calculator, were also hailed as a deciding factor in this year’s judging.